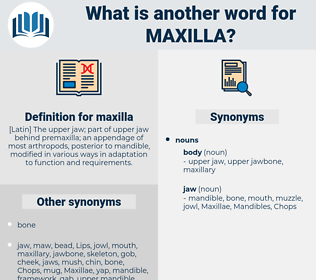 What is another word for maxilla? 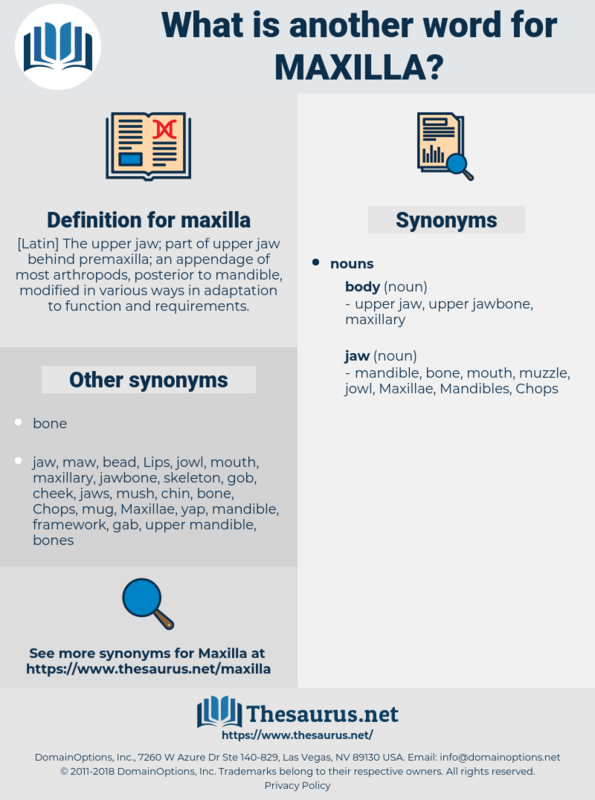 [ Latin] The upper jaw; part of upper jaw behind premaxilla; an appendage of most arthropods, posterior to mandible, modified in various ways in adaptation to function and requirements. meningeal, magically, michael, Minke Whale, missoula, micelle, mess hall, magical, musical, mosaic law, mawkishly, mew gull, mensal, mccauley, misally, mescal, Mukalla, Mohs Scale, mogul, mingle, moonshell, missile, mezcal, monongahela, mickle, megachile, music hall, mosul, mizzle, meningocele, mesial, moghul, mackle, measly, makalu, musically, mamoncillo, mainsail, mislay, messily, mokulu, majuscule, mucosal, mexicali, manacle, miscall, macule, muckhill, monomaniacal, music school, monocle, missal, Megillah, mongol, mugil, mussel, muesli, monocycle, meekly, mangle, muckle, moon shell, macushla, moselle, muscle, megacycle, mongolia, maxwell, miniscule, minuscule, maniacal, macleaya, Mock Azalia, musial, muzzle, mecholyl, macaulay, macula. Intermaxillary Suture, Sutura Intermaxillaris, hard palate.